Paige Dolecki - Stampologist: CTMH Deal of the Day Tuesday, 16 June - Mystery Goodie Box 54% OFF! CTMH Deal of the Day Tuesday, 16 June - Mystery Goodie Box 54% OFF! Whoo-hoo! Close to my Heart's Deal of the Day for Tuesday, 16th June is Mystery Goodie Box #3 (of 6)! Today's box is filled with $220 worth of goodies for just $100 with reduced shipping of just $8 - FANTABULOUS! If you check out my posts of the first two boxes you'll see the boxes actually have even more goodies than they say they will! 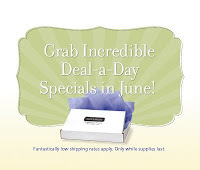 This offer is good until 7AM Pacific Time on Wed. 17th June or until supplies run out so grab your box quickly ladies! Remember, each of the 6 days of boxes (3 down and 3 to go) have a different product focus so you can get a box on EVERY DAY and not get repeats! Order with a friend - even on the same day there are variations in what you get which makes swapping with friends even more fun! Best of all, if you order a box through me you'll be invited to a special SWAP AND CROP PARTY in July where you can swap items you may already have or just weren't your cup of tea with other lucky box owners! Its sure to be a fun party! These boxes are so much fun to get and a terrific deal! What has impressed me the most is the variety of items - there have been kits, paper packs, embellishments, dimensional elements, page protectors, B, C and D size stamp sets, Acrylix blocks and more in these boxes! You can have a whole summer of crafting fun from these incredibly discounted boxes so give yourself and your check book a gift and get one today!